You never know what’s going to happen when you try to take portraits of babies. Throw in the extra unpredictability of kids of any age and it’s a crapshoot whether a photo shoot is going to turn out to be fun with rewarding photos or a series of photos of your children crying. 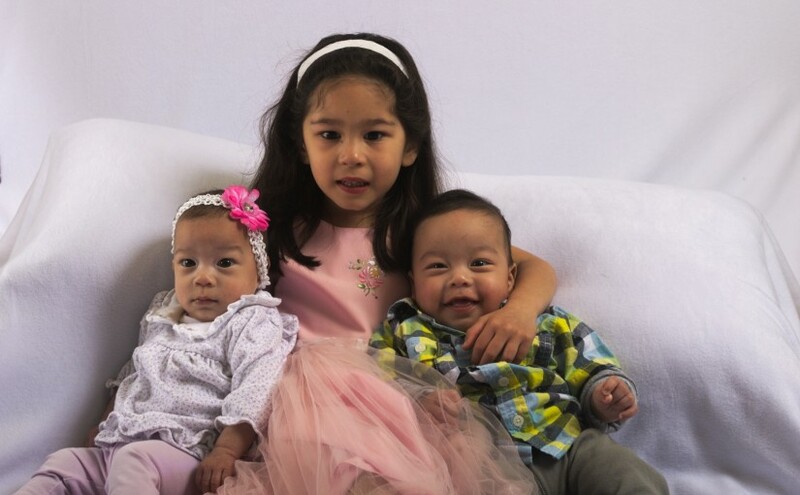 One thing we have on our side with the studio being in the basement is that we can take photos when the kids are ready, not on a hope and prayer that they’ll be ready when we get to Sears, Target, or wherever people are getting portraits done nowadays. So we started off with easy portraits in the morning on the “Baby Portrait Couch”. Hey, it’s a tradition started with Scarlett! Then, when the kids were awake again later, we did the studio shots. They were extremely cooperative and only started crying near the end, which is pretty amazing. After the kids went to go nap, Scarlett and I stayed in the basement so I could use my newly learned Speedlight Gel techniques to get a great purple background behind her. I still need a little practice to get more consistent with it, but one thing I’ve learned is not to trust the back of the camera. This is one of those situations where it’s much, much worse than what you can get with a a proper tone curve in your Raw processor of choice. Without further ado, enjoy the photos. Sam laughs with Easter joy! Scarlett and Sam on Easter!